Description: "This is a traditional Bavarian Schwarzbier style with a deep color and a smooth, rich flavor. Specially roasted malts give the black color and mild roastiness to this beer, while Munich, Caramel, and Honey malts add depth and character to the malt flavor. Moderately hopped with noble aroma varieties to achieve a perfect balance and clean finish. — Buckbean Brewing Co.
Random thoughts: This is part of my series on canned craft beer and my first beer from Nevada. The tasting: Dark brown with reddish hues and a tan head that dissipated slowly. Aroma of coffee, roasted malts, and something sour. Flavor of chocolate and roasted malts, and a tangy sourness—which is quite pronounced. Light in body. It finishes sour. 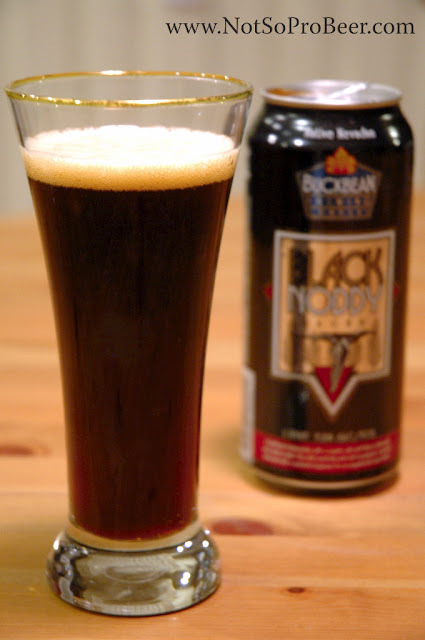 Have you tried Black Noddy or any other Buckbean brews? I would give all Buckbean beers a 1 star. I won't go near the stuff any longer. Terrible. I wouldn't serve Buckbean at the Xi house (that's lower than 1 star). Dreadful. Sorry to hear you both had less than stellar experiences. Before I published my review, I checked out some Black Noddy reviews on Beer Advocate. Probably 30% of people reported sour / tangy flavors. Such drastic inconsistency in beer is a bad thing. I think I'll talk to Buckbean and get their take on it. That said, I'm still willing to try another Buckbean beer.